Last weekend, I got to be a gamesmaster for the first time. It was an interesting experience, not all went to plan, but I did enjoy myself though and it was fun. It was also the first outing for our small group of a new set of rules, Rank and File from Crusader Publishing. Although myself and Iannick have a considerable number of 28mm Napoleonic figures available to put on the table, I have found that less is better, so I decided to go with a small division aside game. I wanted to field both my newly painted Brunswickers as well as a brigade of Austrians that I had painted a couple of years ago, which had yet to see the light of battle. I usually try to find a historical battle to recreate, this was a little difficult with these two forces, but some googling revealed that there was a two month period in the early summer of 1809 when a combined Brunswick-Austrian force existed in the XI Corps of the Austrian Empire. I had settled on recreating the Battle of Gefrees, fought on July 8, when I came across an article in Wargames Soldiers and Strategy Issue 63 with a wargaming scenario for this battle. A few modifications in the order of battle, I did not want to use cavalry in this first outing with this ruleset. Make an offer, I want to get rid of them. As a follow up to our Germans here is my 8th Army Force. Mostly painted with some extra unpainted Forged in Battle infantry figures. Like I said in my first post, I am willing to accept any reasonable offers, and am confident that I am willing to sell these figures below market. Well in just a little under a week, I will get to try out the Rank & File ruleset with my friends in Montreal. There will be just three of us and I will be acting as the referee. Although I do not get to play, I find I am quite looking forward to the game. In the fall we had a Napoleonic game with Curt from Analogue Hobbies acting as a referee and we all had a great time. We recently had a couple of skirmish FIW games using the This Very Ground ruleset with Iannick refereeing between myself and Nicolas, and that also went very well. Certainly having someone who knows the rules and who can arbitrate any questions (we do not have disputes) that come up makes for an excellent gaming experience. I have spent the last month grinding through the rules and I believe I have a pretty good handle on them. Well for our playtest, I went with a brigade aside with my new Brunswickers versus the French. I am trying to test all the rules I can, but have not used any cavalry. I have stuck with the rules as written here with no modifications. I have also decided to use a couple of very large units just to see what would happen. 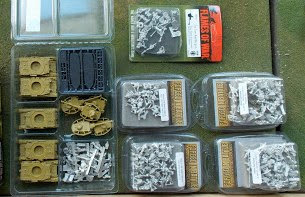 In my armies I have generally 4 and 6 stand battalions, I believe this might be a bit small for this set of rules. I also should at this level, being using 1 stand artillery batteries but I just do not like this look. So a reason for doing this play test is to see what happens, so I can make some adjustments.